Rutgers researchers have shown that GPS technology is not needed to show where a driver traveled. A starting point and the driver's speed are enough. (Phys.org) —In our constantly connected, information-rich society, some drivers are jumping at the chance to let auto insurance companies monitor their driving habits in return for a handsome discount on their premiums. What these drivers may not know is that they could be revealing where they are driving, a privacy boundary that many would not consent to cross. 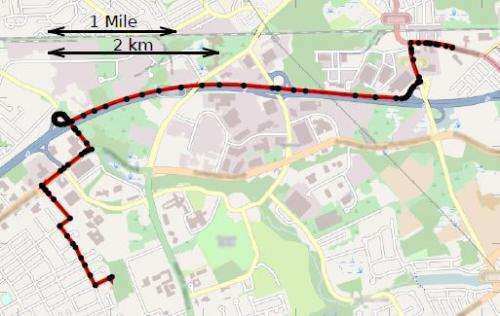 A team of Rutgers University computer engineers has shown that even without a GPS device or other location-sensing technology, a driver could reveal where he or she traveled with no more information than a starting location and a steady stream of data that shows how fast the person is driving. 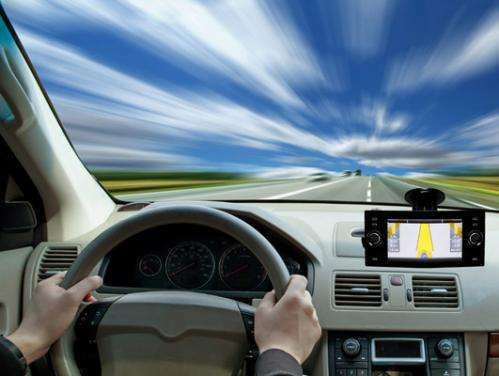 Insurance companies and customers both have incentive to monitor driving speeds, said Janne Lindqvist, assistant professor in the Department of Electrical and Computer Engineering at Rutgers. Drivers who avoid jackrabbit starts and sudden stops are typically lower-risk drivers, and insurance companies benefit by rewarding such behavior. So some companies are offering lower premiums to customers who install a device that constantly measures, records and reports their speed. "The companies claim this doesn't compromise privacy, because all they are collecting is your speed, not your location," said Lindqvist, who is also a member of the university's Wireless Information Network Laboratory, or WINLAB. "But we've shown that speed data and a starting point are all we need to roughly identify where you have driven." Reproducing an exact driving path from this limited and basic information is challenging – and it is less precise than using GPS or cellular signal tracking measurements. But with the researchers' approach, sometimes even one drive is enough to reveal the person's destination within a third of a mile or less. The technique, dubbed "elastic pathing," predicts pathways by seeing how speed patterns match street layouts. Take for example, a person whose home is at the end of a cul-de-sac a quarter mile from an intersection. The driver's speed data would show a minute of driving at up to 30 miles per hour to reach that intersection. Then if a left turn leads the driver to a boulevard or expressway but a right turn leads to a narrow road with frequent traffic lights or stop signs, you could deduce which way the driver turned if the next batch of speed data showed a long stretch of fast driving or a slow stretch of stop-and-go driving. By repeatedly matching speed patterns with the most likely road patterns, the route and destination can be approximated. Lindqvist doesn't claim that insurance companies are actually processing the data to reveal locations. The techniques he and his colleagues are exploring are in their early stages and are not obvious to implement. Insurance companies likely wouldn't benefit from knowing this information, especially if it is costly to obtain. But, he believes, it's conceivable that law enforcement agencies could subpoena this information and run these kinds of complex analyses if they want to find out where someone has driven. "I'm not saying that insurance companies should not monitor speeds like this," he said. "I'm just saying that they should not imply that their speed data collection is privacy preserving. In any case, collecting just speed data compared to GPS data is a better practice since the locations are not directly available." To test how well the elastic pathing technique worked, Lindqvist and his colleagues examined data from six drivers in New Jersey traveling to 46 different destinations over 240 trips, and from 21 drivers in Seattle over 691 trips. For more than 20 percent of the trips, the technique predicted the final destination within a little less than one-third of a mile from the actual endpoint. "In time, we expect improvements will be made to our initial approach," he said. "The data, once collected, do not go away, and improvements may make it possible to plumb more private information." Lindqvist suggests that insurance companies consider alternatives to collecting speedometer readings that can afford better privacy protection. Lindqvist's doctoral student, Xianyi Gao, will present the results of the team's research at the 2014 ACM International Joint Conference on Pervasive and Ubiquitous Computing (UbiComp 2014) Sept. 13-17 in Seattle. Other student contributors include Bernhard Firner, Shridatt Sugrim, Victor-Kaiser Pendergrast, and Yulong Yang. The National Science Foundation funded the research. Dutch student sells his data for €350, but at what price privacy? Maybe they should just log acceleration data beyond a certain threshold (which would be enough to identify those jackrabbit starts and squealing stops). That would probably throw enough fuzzyness into the system to prevent such 'side-channel attacks'. But wouldn't report on their habit of speeding on the way to work for example. Win some, lose some. I would think the faster you drove, the more likely you are headed for the hospital or cemetery. But wouldn't report on their habit of speeding on the way to work for example. You don't get speeding data in any case (unless you log which roads they travel on - which they don't). With this method you might hazard a guess where they are speeding, but that's pretty tenuous to base any kinds of insurance measure on. If you really want you could also log tmes of 'high speed'. As long as there are enough gaps in the data it becomes very hard to map that to real world routes. It's a matter of legality, law has lagged behind ability. We require a precedent to determine that "behaviour" is an acceptable metric, whilst geography, compliance to law, etc are non-admissable.